The Eloquent Woman: "What's the difference when scientists present to other scientists, and to the public?" "What's the difference when scientists present to other scientists, and to the public?" I know that you specialize in helping scientists and medical professionals. I'd like to know what you see as the differences between scientific presentations to scientists and other "normal" presentations. I sometimes get push-back from such clients along the lines "You just can't do that" or "that's not the way it's done." I did a biology degree many, many years ago, but haven't been to any scientific conferences and so I would find your views really valuable. I've pointed many a scientist to Olivia's excellent post on how to simplify a presentation without dumbing it down -- and "dumbing it down" is one of the push-back terms scientists use when they're talking about explaining complexities to public audiences. They often say that the skills I'm teaching them are "completely counterintuitive" to the way they normally present--their comfort zone is the reverse of what you and I would teach as good presentation skills. And the dirty little secret: Despite all their training, it's rare that they actually receive good training in presentation skills. In effect, it's an intellectual area of vulnerability for many of them. Once you get past all the derisive put-downs about presenting, it turns out that many scientists are very keen to learn good presentation skills, but it helps to make the counterintuitive parts transparent to them. 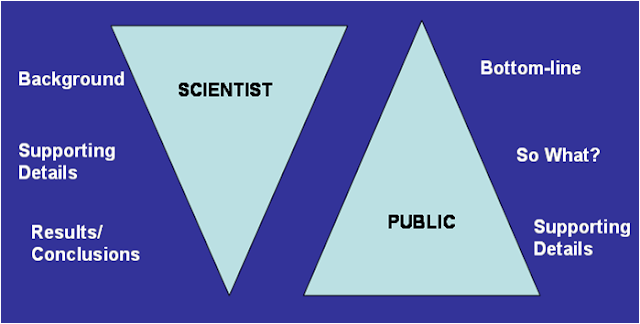 Where the scientist normally presents all the background material first, followed by supporting material and leaving the results and conclusions till the end, public or non-scientist audiences want the bottom line early. They expect the results first, the "what's in it for me?" or "so what?" connection to their real lives, and then (maybe) the supporting details. In a sense, the scientist's presentation style is a traditional narrative: Start at the beginning with the research question, assemble the background, share the supporting details, then come to a conclusion. The narrative moves in chronological order, from "we wanted to find out" to "this is what we concluded." (The format mimics the standard form for a journal article, which no doubt saves time later.) Showing this slide has helped many of our scientist audiences to understand the difference between the two styles, and therefore, why it feels so awkward to present in a different (to them) way. At scientific conferences, researchers present their data so that their peers may poke holes in it, question methodologies and suggest other options, all with an eye to making the research better. It is a specific phase of the scientific process, considered to be the first phase of needed peer review that makes research more reliable. In other words, you present your research at meetings first, and only after revising it appropriately do you submit it for formal peer review and publication in a journal. Perhaps because they know they're likely to be grilled, and certainly because the alternative's way out of their comfort zone, the idea of presenting in a different way can be easily dismissed, as it has with you, as wrong, granstanding or (horrors) just too novel. Only the most senior scientists generally deviate from this norm--another factor that makes it seem pushy for junior scientists to attempt "Presentation Zen" or unusual techniques. Should scientists try better presentation skills, anyway? I say yes. Every scientist I know can attest to sitting through horrific presentations with too many slides and acronyms, monotone delivery, and other poor presentation methods. When they sit through a dynamic, skilled, thoughtful and focused presentation, they're as delighted as anyone else would be. Another issue: Scientists are used to assuming that their audience understands them when they speak to a group of colleagues within their discipline. As a result, they're not used to taking the audience into account--there are lots of assumptions made--and it allows them to use acronyms and shorthand rather than work for clarity. That doesn't work, however, when they are presenting to scientists from many disciplines. While other specialists can usually follow along well, there are many overlapping terms, theories and methods that just don't translate from one branch of science to the next. For a non-scientist, there's a nice feeling to be had when you hear one scientist say to another, "I'm a Ph.D. physicist, and I didn't understand a word you just said." For all those reasons, I still encourage scientists to learn good presentation skills--and have had many companies, universities, professional societies and labs hire me to help them advance in this area. Every audience, even the most technical, deserves clarity, engagement and a well-planned presentation. Related post: How do we balance technical and non-technical in a presentation for a mixed audience? This post and the "balance" post noted above were included in the weekly roundup of the best public speaking articles in the blogosphere on Andrew Dlugan's great Six Minutes blog. Thanks, Andrew! Are you a member of The Eloquent Woman on Facebook? Hit "like" when you get there to join the discussion, see things before they appear here, share your slides or questions. Subscribe to the Step Up Your Speaking newsletter--it's free and monthly--using the box at right. Thank you Denise, that's very useful. I particularly like the diagram from the AAAS. Your explanation of the role of presenting in the scientific process is useful too.